A cat, I�m sure, could walk on a cloud without coming through. Our cats live as part of our family with lots of love and care. They are our beloved friends and they have whole house to disposition. Very important for us is their psychical comfort, self possession and happiness. Our cats are not held in cages, they spend the time of sleeping, eating and games together with us. And also our kittens are growing up in the middle of family. Alomi, Blueskyeyes, Brigantina, Catley Crue, Cattrax, Demiara, Harwood, Joleigh, Keystone, Larix, Oakheaven, Ormeryds, Prancenpaws, Purringwood, Sugarspun, Teahs, von Spindeleben, Whisperwood and other well-known catteries. We always search for a loving home for every kitten and prefer to place them as pets with people who will love them and devote time and care to them. 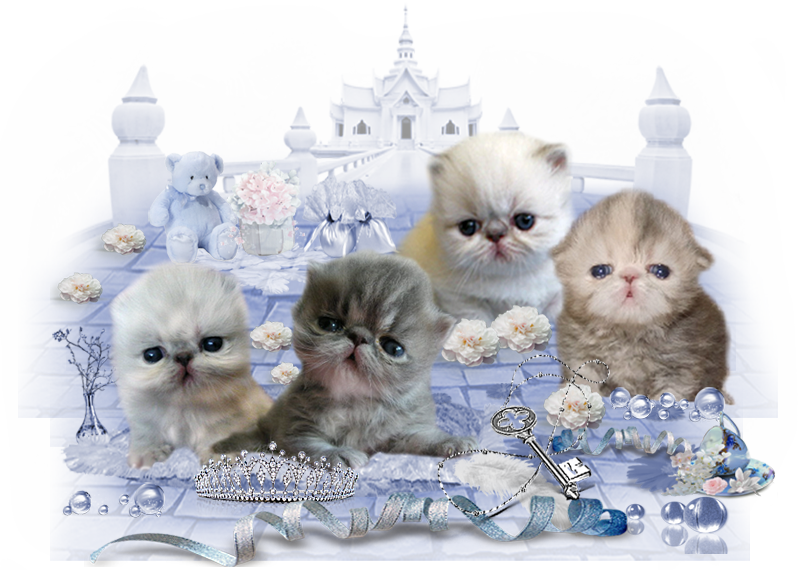 The ROYAL DREAM's kittens have marvellous temperament, they are excellent companions, very affectionate with people as well as with other pets in the house. We offer lifelong breeding service for owners of our kittens, we are any time here with help and advice. Please feel free to contact me with any questions regarding expecting litters or currently available kittens. "One only understands the things that one tames," said the fox. "Men have no more time to understand anything. They buythings all ready made at the shops. But there is no shop anywhere where one canbuy friendship, and so men have no friends any more. If you want a friend, tameme..."
"To me, you arestill nothing more than a little boy who is just like a hundred thousand otherlittle boys. And I have no need of you. And you, on your part, have no need ofme. To you, I am nothing more than a fox like a hundred thousand other foxes.But if you tame me, then we shall need each other. To me, you will be unique inall the world. To you, I shall be unique in all the world..."
"Men have forgotten this truth," said the fox. "But you must not forget it. You become responsible, forever, for what youhave tamed..."
We tied our cats to us for ever, we become responsible for their comfortable lifes. We never sell, or get rid of our old cats, cats - retired and neutered cats by any other way!!!!! All cats with finished breeding carreer stay living with us as a part of our family. Therefore, we have a period (sometimes even longer) when we have no kittens, because the welfare of our cats is more important to us than "breeding" and older cats in our live in deserved retirement and rest, have the same rights to care and attention as breeding cats and do not need free up space for a new, younger and fruitful generation. Our principle is that, all our cats with us lived satisfied and happy life. We thank a lot to new owners of ROYAL DREAM's kittens for lots of love, care and attention. And for all news and pictures from new homes. It is the greatest pleasure for us.